Members of the NUT and NASUWT teaching unions are in dispute with the Government. The failure of the Government to enter into meaningful talks has led to a strike being called. This strike action started in June with a strike in the North-West, another third of the country took strike action on the first week in October and the remaining districts, including London and the South East, will be on strike on Thursday 17th October. Teachers are deeply concerned about the impacts these imposed changes are having on the teaching profession, the recruitment and retention of teachers and on the provision of quality education for pupils. Michael Gove has already asked the School Teachers Review Body to collect evidence for next year on Teachers’ directed time. He says ‘that the limits on teachers’ working time, limits the scope they have to demonstrate their professionalism’. If there is no progress in this dispute then a national one-day strike is scheduled for November. We would welcome support for our dispute by joining our march below or contact Camden NUT (www.camdennut.com/ ) if you would like more information. 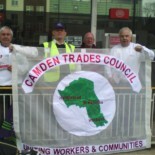 This entry was posted on October 8, 2013 by CAMDEN TRADES COUNCIL.